The fourteenth century ends darkly. Bubonic plague strikes like the Apocalypse, while the Hundred Years War grinds on. The peasants revolt in a bid to wrest power from the nobility, while the church schisms as two pontificates vie for supremacy in a world gone mad. The storms of history rage, but deep in the storm’s eye, one woman stands tall. Despite all odds, she has found connection to a loving God through a series of yoga-like poses she calls body prayer. Julian of Norwich (1342-1416), whose real name has been lost to history, was an anchorite at the Church of St. Julian in Norwich, England, and body prayer, her answer to the terror of her times, suggested yoga centuries before yoga was ever known in the western world. It is as if the obscure English mystic invented yoga spontaneously as she coped with the uncertainty and fear stalking her world, and through her poses, discovered a unique route through the body to a God imbued with the divine feminine. As an anchorite, Julian found respite from the storm living in isolation within the church, and historians speculate she had lost her husband and children to the contagion. She had definitely known illness herself, through an unnamed fever for which last rites were read before she unexpectedly revived. The mystical visions she received while ill later helped her formulate her vision of a forgiving God steeped in the love of the divine feminine, a God quite different from the dark deity most of her contemporaries understandably feared. She reached her God through body prayer, a form of prayer through movement of her own invention. Through body prayer, Julian approached divine union through the body in much the same way a yogi approaches the higher self through bodily movement. In Julian’s case, this can be understood as a very feminine path to the divine, at odds with the prevailing masculine tradition of her time. In the Middle Ages, Christian mysticism usually did not go through the body; instead it transcended the body and left it behind. Body Prayer is comprised of four poses: Await, Allow, Accept, and Attend. The first pose, Await, is a posture of receiving, held with cupped hands extended at the waist to receive the presence of God. The second pose, Allow, is a posture of opening, reaching up with the hands open to the coming of God’s presence. The third pose, Accept, takes in whatever comes, standing with hands cupped at the heart. The final posture, Attend, is assumed with hands extended and palms open in willingness to act on what has been given. While yoga evolved in India in the fifth and sixth centuries BCE, it did not come West until the late nineteenth to early twentieth centuries of our own era. Even so, the movements of Julian of Norwich’s body prayer have much about them of the yoga sequence familiar to the modern yogi. The pose Await is reminiscent of the solid grounding found in mountain pose. Her second pose, Allow, recalls a sun salutation, which is initiated by raising the hands to meet above the head. The pose Accept suggests anjali mudra, the hands cupped at heart level pose of yoga prayer. The final pose Attend is reminiscent of extending the open hands to simply receive energy. The movements of body prayer have the same effect as the movements of yoga. Both sequences induce relaxation to reach a common meditative state, and it is in this meditative state that we can connect to our higher selves. 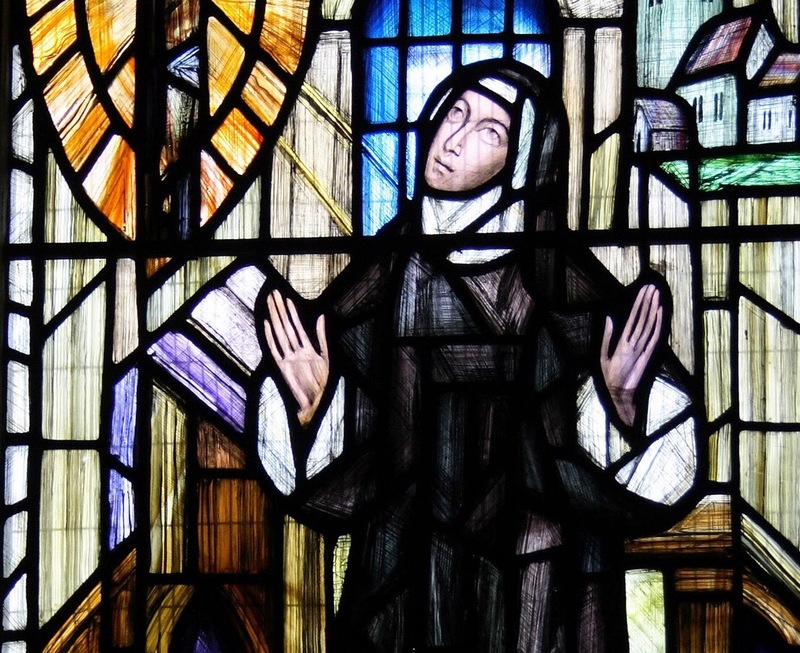 Julian of Norwich experienced this connection, as perhaps some of us do, as divine union, what she called a ‘oneing’ with God. The idea of ‘oneing’ is not unlike the meaning of the word yoga, which is Sanskrit and translates as ‘to yoke’ with the divine. The God Julian found through her path of opening the body to divine ‘oneing’ was radical, with feminine, modern sounding attributes when compared to the harsh patriarchal god worshiped by most of her contemporaries. Julian’s God was, to her, both mother and father, and in a foreshadowing of American Transcendentalist thought, she saw God in man, and God in everything. Her God promised salvation to all, as she wrote in her book, Revelations of Divine Love, the first surviving book written by a woman in English around the year 1395. She tells us she has had a vision of a tiny thing the size a hazelnut, and she has held this tiny thing in her hand. Her ideas were hopeful, and they, like her route through the body to such ideas, clearly fell outside of regular contemporary church doctrine. She had managed to imbue the punishing father-god feared by a population reeling from sickness, death, and war, with the softer aspects of the divine feminine, mainly love. And luckily, perhaps as she found all of this within the structure of the church, she was never persecuted for her views. Today the twenty-first century dawns with swirling uncertainties. The political and religious landscape shifts perilously beneath our feet as fear and the unknown replace old certainties. We, too, are plagued by war and threatened by pandemic. We cope with the additional specters of terrorism, meteorological chaos, and climate degradation. We bear witness to the sixth extinction as so many species silently exit our world forever. Our future is perhaps no more certain than Julian’s, and we stand at the storm’s eye now as she did then. In our own uncertain times, we take to our yoga mats in much the same way she took to body prayer. Through the poses of yoga, we find a calm oasis and a centering point, a meditative route through bodily movement to the higher energy that informs and links us all. This is the higher energy of love and connection, and it is found within aspects of the same divine feminine, the same forgiving God Julian discovered through body prayer. As the storm swirls around us, we can return from our yoga practice secure in the balance of these insights, and because all things are connected, we can share the oasis we have found with others, and we can hope it spreads for the greater good. Mary Petiet is the author of Minerva’s Owls (Homebound Publications), which remembers the divine feminine to re-envision the world. Her work appears in many journals and several anthologies, including Wildness, Voices of the Sacred Landscape . She is a regular contributor to Edible Cape Cod Magazine, a member of the Steeple Street Poets, and a columnist at Seekingblissdaily.com.